We are happy to teach you in small groups of up to 4 people, or by yourself. Small groups allow for optimal learning success and lessons tailored to individual needs and abilities. There are no limits to age. 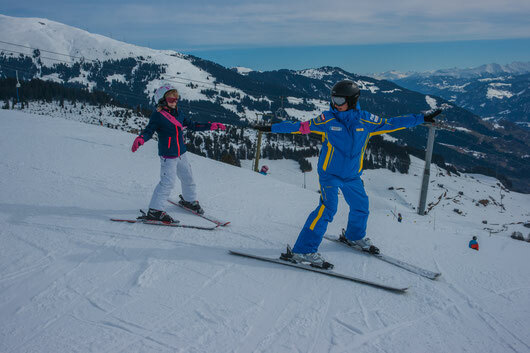 Our ski munchkins can be introduced to skiing as of only 3 years old through private lessons. The following principle applies: 20 minutes of physical activity/ year per age. Furthermore, we offer the possibility to be instructed by the teacher of your choice. Please ask in time, so we can reserve the instructor for you (contact us) or use the registration form. Please note: Pre-registration is required for our private lessons. Due to organisational reasons cancelations can only be considered of, if done 24 hours before the agreed date. We teach in all weathers. The subject matter is based on the Swiss Snow League. please note: munchkin lesson times differ from those of the others. Would you already like to reserve your private lesson today? Simply follow this link, complete the form and send it to us. We’ll take care of the rest. Meet your private instructor at one of our meeting points which you can find here.